Generics and Biosimilars Initiative Journal (GaBI Journal). 2016;5(3):105-13. Biological molecules represent a significant portion of therapies utilized in Canada. Biosimilars, also known as subsequent entry biologics (SEBs) in Canada, are highly comparable versions of the originator products. Over the next few years, a number of patents for innovator biologicals will expire in Canada and this creates a tremendous opportunity for the entrance of SEBs. In Canada, SEBs must first be evaluated via Health Canada’s SEB regulatory pathway. Following approval, SEBs must also be assessed for cost-effectiveness by the national health technology assessment agency, Canadian Agency for Drugs and Technologies in Health (CADTH) under the Common Drug Review (CDR) or pan-Canadian Oncology Drug Review (pCODR) processes. CDR and pCODR provide reimbursement recommendations to the provincial/federal public drug plans and cancer agencies. At the time of this writing, multiple SEBs have been approved by Health Canada. Although SEBs are approved after thorough evaluation by regulatory agency, there are concerns expressed by various medical communities, specifically regarding issues of indication extrapolation and interchangeability. The purpose of this paper is to provide a brief overview of the current status of SEBs in the Canadian context, as well as potential lessons that can be learned from European authority on SEBs. Biologicals are a class of drug that is derived from living organisms . The majority of biologicals are utilized in the areas of oncology, inflammatory diseases and diabetes [2–4]. According to a recent report published by the University of British Columbia, the per capita spending on biologicals for inflammatory conditions alone in Canada have more than doubled from CAN$18 in 2007–2008 to CAN$45 in 2012–2013 , which contrasts with relatively stable overall per capita spending for all prescription drugs (CAN$661 and CAN$656 in 2007–2008 and 2012–2013, respectively) . In 2010, spending on biologicals was approximately CAN$3 billion, which constituted 14% of the Canadian pharmaceutical market. It is expected to grow to about 20% by the end of the decade, creating substantial financial impact for public and private payers. A large number of patents for high cost innovator biologicals are set to expire in Canada within the next 10 years, e.g. Avastin, Herceptin, Humira, Lucentis, Rituxan. This will lead to the rapid development of subsequent entry biologics (SEBs). For a review of the current list of innovator biologicals set to expire in Canadaand SEBs in development, please refer to a report published recently by the Canadian Agency for Drugs and Technologies in Health (CADTH) . Introduction of SEBs may lead to increased access for many patients, although SEB developers face many challenges prior to having their products reach patients. This paper provides an overview of the current regulatory and health technology assessment (HTA) environments for SEBs in Canada,positions of various medical and disease associations, as well as lessons that can be learned from Europe to increase uptake of SEBs. Please note that the terms ‘biosimilar’ and ‘SEB’ will be used interchangeably in this paper. Around the time of the approval of the first SEB in the European Union (EU) (Omnitrope) in 2006, Health Canada released an SEB Factsheet , which signalled the development of the first SEB regulatory guideline in Canada. In March 2010, the Guidance for Sponsors: Information and Submission Requirements for Subsequent Entry Biologics (SEBs) was released . The term ‘subsequent entry biologic’ is defined as ‘a biologic[al] drug that enters the market subsequent to a version previously authorized in Canada, and with demonstrated similarity to a reference biologic[al] drug. An SEB relies in part on prior information regarding safety and efficacy that is deemed relevant due to the demonstration of similarity to the reference biologic[al] drug and which influences the amount and type of original data required’. Because biologicals are produced in living organisms, and they are highly sensitive to process changes, it is virtually impossible to make identical copies of these protein-based therapeutics. Therefore, an important consideration for SEBs is that they are not ‘generic biologicals’. Many characteristics associated with the market authorization process use for generic pharmaceutical drugs do not apply. As a result, SEBs cannot be considered pharmaceutically or therapeutically equivalent to the reference biological products. Under the Health Canada SEB pathway, the SEB manufacturer presents a reduced clinical and non-clinical package to show that the SEB is highly comparable to the reference biological via a series of comparability exercises, e.g. analytical testing and biological assays. This is particularly important for SEB manufacturers since additional clinical/non-clinical requirements would add significant time (7–8 years) and cost (US$100 million to US$250 million) to develop an SEB compared to small-molecule generics (US$1 million to US$4 million) . As discussed later, the importance of demonstrating physicochemical and in vitro functional comparability between the SEB and the reference biological is also a key for the approval of indication extrapolation (the granting of indication approved for the reference biological to the SEB without conducting clinical trial for that indication). In December 2015, Health Canada issued a consultation to stakeholders on a revised Information and Submission Requirements for Subsequent Entry Biologics (SEBs) guidance documents [9, 10]. Key revisions included addition of further guidance with respect to considerations in the selection of a reference biological drug; additional detail with respect to considerations when performing non-clinical and clinical studies for SEBs, including discussion with respect to immunogenicity, the use of the most sensitive population in clinical trial design and a new section on extrapolation; and a new section which promotes early consultation with Health Canada, as well as the launch of three-year pilot for SEB Scientific Advice Meetings to allow for discussion of an SEB with Health Canada early in the development process . The latter addition is very much similar to the European Medicines Agency’s (EMA) scientific advice and protocol assistance process , suggesting Health Canada’s continuing effort to harmonize its SEB regulatory process with other international agencies. The Canadian drug plan market is a mix of public and private systems. Public drug plans make extensive use of HTA as part of the reimbursement decision-making process. Eligible non-cancer prescription drugs approved by Health Canada are reviewed by the Common Drug Review (CDR) and the Institut national d’excellence en santé et en services sociaux (INESSS; province of Quebec only) [12, 13]. In contrast, eligible approved cancer drugs are reviewed by the pan-Canadian Oncology Drug Review (pCODR) . INESSS also reviews eligible cancer drugs. Both the CDR and pCODR are part of the CADTH that provides reimbursement recommendations that are considered by participating public drug plans. The province of Quebec does not participate in the CDR and the pCODR process. In the fall of 2009, CADTH initiated a pilot project specific to the submission and evaluation of SEBs due to the different regulatory data requirements (CDR Update – Issue 59, released 30 June 2009). The purpose of the pilot project was to determine the requirements for SEB submissions, establish a review framework, and learn about Health Canada’s approach. The pilot project was to be evaluated after three SEBs had been reviewed and stakeholders’ feedbacks were to be sought at the end. The first SEB submitted under this pilot process was Omnitrope, see extended discussion that follows. However, four years later, no other SEBs had been submitted; and because multiple SEBs with indication extrapolation were imminently expected, CADTH terminated the pilot project and began a new consultation with stakeholders to develop a new standardized procedure and process in the fall of 2013 . As a result of theconsultation process, a new Common Drug Review Procedure and Submission Guidelines for Subsequent Entry Biologics was issued in March 2014 . The submission requirements for SEBsrepresent a significant deviation from the existing requirements for non-SEB products. According to CADTH, CDR recommendations for SEBs will be based on: i) patient and public perspectives on the impact of the drug; ii) safety, efficacy and effectiveness of the drug compared to alternatives; iii) therapeutic advantages relative to current accepted therapy; and iv) cost and cost-effectiveness relative to current accepted therapy . CADTH also noted that while the new procedure is not a pilot project, it would evaluate the process after a few submissions. And as with Health Canada, the CDR does not issue statements regarding interchangeability. Interestingly, however, in recent recommendations for the SEBs Grastofil (filgrastim) and Basaglar (insulin glargine), the CDR’s Canadian Drug Expert Committee (CDEC) noted that patients being treated with the reference biological should be considered for switching to SEB after a discussion between patients and physicians [18, 19]. Currently, pCODR does not have a separate procedure and process in place for the submission and evaluation of SEBs. However, since pCODR is also under the jurisdiction of CADTH, it is expected that the process will be similar to that of the CDR. In August 2010, the Canadian Premiers announced the pCPA initiative at a meeting of the Council of Federation (COF). The pCPA is a process under the COF’s Health Care Innovation Working Group (HCIWG). The intended goal of the pCPA is to combine the purchasing power of public drug plans across multiple jurisdictions in order to ensure benefits are cost-effective, and to increase access to drug treatment options across jurisdictions. In addition, the pCPA also serves to reduce duplication of negotiations and to address the issue of inconsistent drug listing decisions across the country that were the results of each jurisdiction making individual decisions. All provinces (excluding Quebec) and Yukon (territory) were part of the initial alliance . However, Quebec announced their intention to join the pCPA  and have done so. Formally, the pCPA negotiations are conducted on brand-name drugs and generic drugs. As the pCPA process does not preclude existing evidence-based drug reviews, only (branded) drugs that have been assessed by the CDR and pCODR and received generally positive, i.e. not ‘Do Not List’, recommendations would be considered for negotiations. It should be noted that province-territory specific review may occur following the recommendations of CDR or pCODR in the absence of the pCPA process . To date, there have been no published submission and evaluation processes specific to SEBs that are available to the public at both the provincial and federal drug plans. However, we believe that many jurisdictions are actively evaluating and adopting their existing submission guidelines to meet the unique aspects posted by SEB submissions. Omnitrope is an SEB of the recombinant growth hormone (GH) somatropin (somatotropin; marketed as Genotropin by Pfizer Canada) produced in Escherichia coli indicated for the treatment of GH deficiency in children and adults . It was the first SEB to receive regulatory approval by Health Canada. Omnitrope was filed during the period in which Health Canada was developing its SEB guideline, as such, it provided the regulatory agency the opportunity to gain the experience needed to validate the concepts and principles behind SEBs [25, 26]. Several issues were encountered during the evaluation of the file and Health Canada had to exercise a certain degree of flexibility in the evaluation of the first SEB. First, Genotropin was used as the reference biological, which at the time, while authorized, was not marketed in Canada. Following a series of discussions, along with the availability of an extensive set of comparability data as well as other reasons, Health Canada eventually accepted the use of Genotropin as a comparator. Second, a reduced preclinical package was accepted in which full pharmacodynamic studies were accompanied by reduced toxicology information but no pharmacokinetic information was provided. Third, while Health Canada preferred equivalence trial, it accepted a complex and non-conventional crossover study as a pivotal trial. At the time of filing, no trials submitted for Omnitrope were conducted in adults; however, it was considered acceptable to extrapolate the indication of GH deficiency to adults based on the molecule’s mechanism of action, disease pathophysiology, as well as the suitability of the adult study population with GH deficiency since childhood. Health Canada also requested post-marketing commitments that included long-term follow-ups and safety considerations. Overall, the combination of several critical elements led to the regulatory approval of Omnitrope for both the evaluated and extrapolated indications [25, 26]. 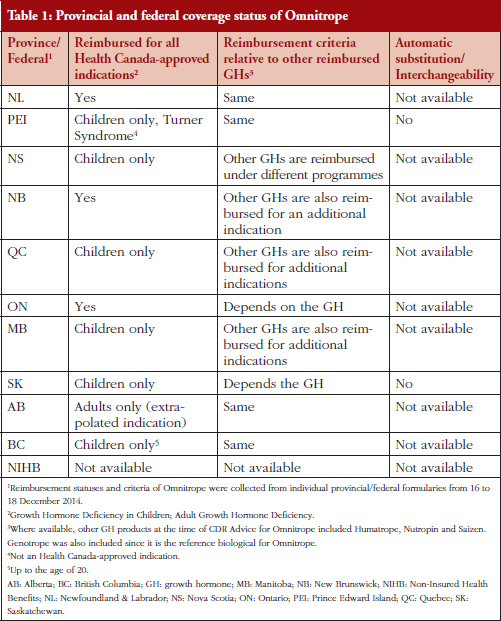 Consistent with Health Canada policy, and the fact that the reference biological Genotropin was not marketed in Canada at the time, no statement regarding interchangeability and substitution of Omnitrope was made. Approximately two months following regulatory approval, Omnitrope was submitted to the CDR for HTA. Since the SEB evaluation framework was still in development, a typical recommendation was not given, instead, an ‘Advice’ was issued . In the report, the Canadian Expert Drug Advisory Committee (CEDAC) of the CDR advised the ‘drug plans [to] consider a similar reimbursement policy for Omnitrope as for other growth hormone products’. Table 1 lists the provincial and federal public reimbursement statuses of Omnitrope. Results indicate that all provinces provide coverage for Omnitrope. Although Omnitrope is not listed on the Non-Insured Health Benefits (for First Nations) Drug Benefit List, it is likely reimbursed on a case-by-case basis. At least two provinces (Prince Edward Island and Saskatchewan) explicitly stated that Omnitrope is not interchangeable. Inflectra/Remsima, developed as CT-P13 by the Korean company Celltrion, is an SEB of the monoclonal antibody (mAb) against the tumour necrosis factor-alpha (TNF-α), infliximab (marketed as Remicade by Janssen). CT-P13 was the first mAb SEB approved by Health Canada and Celltrion received regulatory approval (notice of compliance; NOC) for Remsima in January 2014 . Hospira Healthcare Corporation, following a subsequent licensing agreement with Celltrion, received an NOC in June 2014 as the manufacturer for CT-P13 under the brand name Inflectra . However, as a result of legal proceeding initiated by Janssen in July 2014, the NOC granted to Hospira was quashed in March 2015 . Although Hospira remains the marketer of Inflectra in Canada, the change in NOC status serves as an inconvenience from a logistical perspective and this highlights one of the ways that innovator companies are dealing with competitors. At the time of regulatory submission, the finalized version of the Guidance for Sponsors had already been published . Because CT-P13 is a mAb, the processes involved in demonstrating its biosimilarity to Remicade was far more complex compared to Omnitrope [26, 28, 29]. The pivotal trials submitted for regulatoryevaluation included a single phase III therapeutic ‘equivalence’ trial conducted in rheumatoid arthritis (RA) patients and a single phase I pharmacokinetic trial conducted in ankylosing spondylitis (AS) patients, both against Remicade. In Europe, CT-P13 was approved by EMA for the two evaluated indications and was also granted authorization for six other indications (psoriatic arthritis, psoriasis, adult and paediatric Crohn’s disease, as well as adult and paediatric ulcerative colitis) based on extrapolation. In contrast, Health Canada only approved the evaluated indications and two of the extrapolation indications of psoriatic arthritis and psoriasis [28, 29, 31, 32]. Several contentious issues arose surrounding the regulatory approval of CT-P13. Specifically, there were questions regarding whether RA was a sensitive enough disease model for detecting therapeutic differences between products, in part, due to the concomitant use of the immunosuppressive methotrexate [33, 34]. Furthermore, it has been suggested that RA and AS models are not the most sensitive models for measuring immunogenicity [33, 34]. In addition, difference was observed in the most sensitive of the in vitro FcγRIIIa-dependent assay, raising the question of whether CT-P13 can be considered similar to Remicade [33, 34]. Nevertheless, EMA considered the clinical evidence submitted to be acceptable for approval of all requested indications, whereas Health Canada took a slightly more conservative approach in making its decision due to issues surrounding differential FcγRIIIa activity [28, 29, 31, 32]. Hospira, now a Pfizer company, subsequently received regulatory approval for the adult indications of Crohn’s disease (including fistulizing Crohn’s disease) and ulcerative colitis . However, the evidence basis for the anticipated regulatory approval remains to be determined, i.e. whether paediatric data was submitted for regulatory evaluation. Both Inflectra and Remsima were submitted to CDR following regulatory approval and represented the first set of SEBs (and first mAb) submitted under the new CDR SEB submission procedure. Remsima was voluntarily withdrawn from the CDR review . In December 2014, the CDEC of the CDR issued the recommendation of ‘List with clinical criteria and/or conditions’ (LWCC) for Inflectra in which the conditions were for the drug to be used ‘in patients for whom infliximab is considered to be the most appropriate treatment option’, and for Inflectra to be listed in the public formularies ‘in a manner similar to Remicade’. The LWCC recommendation applied to all the Health Canada-approved indications for Inflectra (including the two extrapolated indications) . Following the release of the recommendation, Inflectra was submitted for negotiation under the pCPA process and was completed in November 2015 . It is unclear why the process took almost a year but Inflectra represented a first true SEB with multiple indications (approved and subjected to be approved) with substantial budget impact. Therefore, this negotiation may have served as a learning process for the pCPA. The submitted price of Inflectra represented a ~31% discount  relative to Remicade (based on the lowest listed public price in Quebec). However, this level of discount is not seen in other regions. For example, in Norway, the Finnish company Orion Oyi successfully won the tender to supply the country with CT-P13 (also being sold under the name Remsima), with a 69% price discount relative to Remicade, lower than the 51% discount that Hospira was offering . Such discounts are far more aggressive compared to the 15–30% price reduction seen for other biologicals . Although not entirely comparable, the nearly 70% discount is most commonly seen for non-biological generic drugs. This highlights the price pressure that biosimilar companies face. Questions have been raised regarding the sustainability of biosimilar companies under such pricing competition . In February 2015, INESSS made a landmark decision regarding the reimbursement of Inflectra . Recognizing that both Inflectra and Remicade ‘have the same generic name, form and content’, INESSS stated that the lowest price would be the price reimbursed for both infliximab products for the four indications (currently Inflectra has the lowest price on Régie de l’assurance maladie du Québec’s [RAMQ] List of Medications). Patients must pay the difference if they wish to receive Remicade. The most significant observation is that the ‘lowest price method’ is applied to Inflectra, perhaps suggesting a form of interchangeability. In its deliberation, INESSS recognized that the lack of knowledge (regulatory and scientific) impedes acceptance of SEBs in Canada. However, it hopes that its decision will allow prescribers to appreciate the merit of Inflectra. INESSS has also recognized that factors such as accessibility to certain clinics can limit the uptake of Inflectra. Indeed, in the most recent issue of the formulary (List of Medications) , RAMQ stated that the only exception to the lowest price method applicable to infliximab is when prescribers indicate to the pharmacist that Remicade is preferably prescribed to Inflectra because the Remicade perfusion centre is closer to the patient’s home or is more readily accessible, given the patient’s health condition, compared to those for Inflectra. RAMQ stated that this exception has an end date of 3 October 2016. After the successful completion of the pCPA negotiation, public plans began to list Inflectra on their formularies. Compared to Quebec, the publicly available list prices of Inflectra across the plans represented between 33–47% discount relative to those of Remicade, which are much higher than Quebec, see Table 2. Perhaps more significantly, many of the public plans preferentially reimburse Inflectra over Remicade for patients new to infliximab, i.e. new infliximab patients will only be covered for Inflectra, and those who failed one infliximab will not be allowed to switch to another infliximab. Some Atlantic provinces also provide reimbursement for Inflectra for indication (psoriatic arthritis) that is not reimbursed for Remicade. This is a clear signal from the drug plans to bolster the success of SEBs. Despite such generous reimbursement policy, it appears that public plans are still cautious regarding interchangeability. Furthermore, only Ontario has reduced the barrier to access to Inflectra (Limited Use – no prior authorization required) compared to Remicade (Exceptional Access – prior authorization required) while the remaining provinces still require prior authorization to access Inflectra. Filgrastim is the recombinant version of the human glycoprotein granulocyte colony-stimulating factor (G-CSF), which is used to treat neutropenia. Amgen currently sells the innovator filgrastim under the trade name Neupogen. Since the patents on Neupogen expired in Europe in 2006, several versions of the filgrastim SEB have become commercially available in the region . Apotex’s filgrastim SEB, Grastofil (co-developed with Intas Pharmaceuticals Ltd), is currently being sold in Europe, and has recently been accepted for filing by the US Food and Drug Administration (FDA) . Grastofil has been approved by Health Canada for all indications approved for Neupogen although the process has not been smooth as indicated by a patent litigation with Amgen . As mentioned above, Grastofil has been assessed by the CDR and has received a LWCC recommendation from CDEC in March 2016 . Recently, Eli Lilly also launched the SEB version of insulin glargine, Basaglar. Similar to Grastofil, CDR has issued a LWCC recommendation and CDEC also included a ‘Of Note’ commentary . Both Grastofil and Basaglar are under pCPA negotiations as of this writing. Merck Canada has also submitted an SEB version of etanercept (brand name to be determined) and awaiting regulatory approval and CDR recommendation as of this writing . In terms of the spending by private payers, a 2012–2013 Canadian report showed that private insurers paid approximately 35% of all drugs but this was increased to 42% for biologicals for inflammatory conditions, whereas public payers covered 43% for both . The above statistics highlighted both the increasing use of biologicals and the significant financial impact on private payers. Amid these changes, private insurers are seeking ways to offset costs, which include but are not limited to increasing premiums and/or utilizing prior authorizations. Indeed, the introduction of SEBs represents a significant opportunity to reduce cost forprivate insurers. For instance, the Canadian private insurer TelusHealth has specified in its Remicade reimbursement special authorization form that patients must have tried and failed Inflectra prior to being authorized to use Remicade . Janssen, in response to the competition, has entered into a preferred pricing agreement with Express Scripts Canada to provide reduced pricing for Remicade for private drug plans offered by providers such as Manulife and Empire Life . In a survey of Canadian rheumatologists (81 respondents) , 31% were familiar with SEBs. Physicians with greater than 20 years of practice were significantly more likely to be familiar with SEBs compared to respondents with less than 20 years of experience. In addition, approximately two-thirds of the respondents indicated that they were unlikely to offer an SEB as initial therapy if cost was not an issue, mostly due to greater familiarity with brand-name drugs and uncertain long-term safety of SEBs. Even if public and private payers mandate the use of SEBs of an anti-tumour necrosis factor-alpha (anti-TNF-α) biological that physicians would normally not prescribe, e.g. adalimumab is preferred, but an infliximab SEB is mandated, half of the physicians were unlikely to offer them to patients. What is more interesting is that nearly half of the respondents indicated that they would use a non-anti-TNF-α biological to avoid using the SEB. Finally, over half of the respondents disagreed with indication extrapolation to psoriatic arthritis and ankylosing spondylitis, citing clinical and pathophysiological differences versus rheumatoid arthritis. Based on this survey, although rheumatologists are aware that biologicals are costly for their patients (as shown by three quarters of the respondents indicating that patient assistance programmes have an impact when considering biological therapy), one-third of the respondents demanded at least a 50% price reduction to offset the risk associated with switching to an SEB. While there are certain limitations to the survey, the results suggest that many physicians still have preference for the originator products, and that significant barriers exist for the wide uptake of SEBs by Canadian rheumatologists . Indeed, considerable discussions have taken place within various medical communities and a number of associations (Canadian Rheumatology Association [CRA]; Ontario Rheumatology Association [ORA]; Canadian Dermatology Association [CDA]; and Canadian Association of Gastroenterology [CAG]) have issued position statements regarding SEBs. The overall consensus of these medical associations appears to be that patients should have access to safe and affordable treatment options. Some do not agree on extrapolation of indication while most also agreed that SEBs should not be considered as interchangeable and no automatic substitution should be allowed. Furthermore, most agreed that distinctive International Nonproprietary Name (INN) should be used for SEBs; and all agreed that post-marketing monitoring/registry should be required [51–54]. The Canadian Association of Medical Oncologists has not yet publicly issued a position statement regarding oncological SEBs. Perhaps those who will be the most directly impacted by SEBs are the patients themselves. Input from patient groups was taken into consideration in the deliberations of both CDR and INESSS [37, 42]. In the Inflectra reports, patients conceded that although therapeutic options are required for those with arthritis, and SEBs offer another biological drug therapy that may be effective for patients who are biological-naïve or who have failed on other biological drugs, many are uncertain whether SEBs actually offer additional therapeutic options. Some patients questioned whether SEBs are tested as rigorously or even perform as well as the reference product, and were even concerned that because not all indications were evaluated, this could be seen as being in a clinical trial in a real situation for verifying the efficacy and safety of SEB for these indications. There was also concern regarding the potential for switching of Remicade/Inflectra due to the same non-proprietary name between these two products. From a patient access perspective, some expressed concerns about whether SEB manufacturers would offer patient support. Patients expected that Inflectra will be less costly than Remicade and the money saved can potentially be used to increase access to treatments, some patients believe that they will be forced to choose the SEB due to their insurance policy [37, 42]. Several patient groups/disease societies (the Canadian Arthritis Patient Alliance [CAPA], The Arthritis Society, Crohn’s and Colitis Canada, Canadian Skin Patient Alliance [CSPA], as well as various academic institutions) issued their views on the subject of SEBs. Similar to the positions expressed above, all agreed that there should be no automatic substitution for SEBs, that distinctive names should be given, and that post-marketing surveillance should be mandated. However, the view regarding the issue of indication extrapolation is less than unanimous [55–60]. A recent meeting involving a cross-disciplinary group of specialist physicians (dermatology, gastroenterololgy, nephrology, oncology and rheumatology), patients, patient group representatives and pharmacists, reached a consensus that indication extrapolation can be considered but should be based on robust and in-depth clinical data . Despite the perceived value of SEBs, the uptake of SEBs has been relatively slow. According to IMS, the historic (2007) estimation for biosimilar market in the EU was expected to be US$16–20 billion per year by 2010–2011, and it was forecasted that the sales of biosimilars would be US$25 billion by 2020. However, by 2012, the actual sales were only US$0.6 billion [62, 63]. The EU has higher biosimilar uptake compared to Canada, partly due to the early introduction of biosimilars. Within the EU, biosimilars for molecules such as G-CSF and epoetin (EPO) have relatively high uptake percentage, and this has been in part contributed by the role of the payers in these countries. In the UK, biosimilar G-CSF is hospital prescribed. A single preferred agent is selected via a transparent multifactor tender. Hospital protocols are changed to reflect the winning bid with exception criteria for defined patient groups. Success of uptake in achieving real savings is also published. All these processes led to a ~90% uptake for biosimilar G-CSF in the UK. In Germany, outpatient physicians treating statutory health plan patients are members of the Kassenärztliche Vereinigung (KV), the professional association of outpatient physicians. There are 17 KVs in total, each covering a geographic region in Germany. There are several strategies that are used to facilitate biosimilar uptake. For instance, biosimilar quotas are utilized for EPO in each of the KV regions to increase uptake. In addition, physicians’ budgets are tracked by prescription utilization management tools and physicians are also provided with education sessions to reinforce the concept of biosimilar medicines. Finally, payers also endorse biosimilars as safe and effective via ‘dear doctor’ letters and address potential concerns. As a result, the uptake for biosimilar EPO is ~60% . In Norway, the combination of the tendering system and a substantial discount has resulted in a more than 90% market share for the infliximab biosimilar as of mid-2016 . Clearly, strong regulatory presence and price incentive are needed to assist the uptake of biosimilars, particularly for countries with well-developed regulations. Overall, the current trend in the US, EU, and emerging markets is that payers and policymakers are expected to increasingly become biosimilar advocates. This is partially reflected in the 2015 European Generic medicines Association–European Biosimilars Group meeting in the UK (April 2015) where both EMA and FDA agreed that biosimilars could be licensed for multiple indicationswithout performing clinical studies for each area. The Vice-Chair of the EMA Working Party on Similar Biological Medicinal Products (BMWP) Dr Martina Weise, FDA’s Center for Drug Evaluation and Research’s Associate Director of Therapeutic Biologics Dr Leah Christl, and EMA Head of Quality Dr Peter Richardson, all stressed that analytical methods and functional assays, e.g. pharmacokinetic and pharmacodynamics, are more sensitive to quality attributes and often much more valuable to regulators, and that clinical studies are the most blunt tool we have to confirm the similarity which are sometimes not needed . FDA’s Dr Leah Christl also went on to state that they have seen sponsors who identified analytical differences between the biosimilar and the reference product but concern was not raised from a regulatory perspective. Finally, Dr Leah Christl also stated that FDA is planning outreach programmes to educate industry and prescribers about the importance of structural and functional analysis over patient studies in proving similarity . Indeed, as stated elsewhere in this paper, policies to promote SEB uptake in the form of preferential reimbursement have been adopted by the Canadian provincial reimbursement bodies. However, without reducing barrier to access, e.g. removal of prior authorization, or allowing interchangeability, the full potential of SEBs in providing true cost savings to public plans may be limited. The SEB regulatory and reimbursement experience in Canada remain in its infancy. Although substantial economic benefits can be achieved with the use of SEBs, their wider acceptance by payers, prescribers and patients remain to be seen, especially with the first mAb, i.e. Inflectra. More support is needed in order to allow stakeholders to fully comprehend the concept of SEBs so that these therapies can be properly evaluated and utilized. The authors would like to acknowledge Mr Ferg Mills, MSc, Principal Consultant, Wyatt Health Management, for his valuable input into the preparation of this article. A portion of the information contained in this article has previously been presented at ISPOR North America (2015, 2016) and CADTH Symposium (2016). Competing interests: Dr Eric Siu is employed by Wyatt Health Management (WHM) and Mr George Wyatt is the owner of WHM. WHM has worked with one or more companies that manufacture the biosimilars listed in this publication. However, WHM did not receive funding or use proprietary information from these sources for the preparation of this manuscript. 2. Leavy O. Therapeutic antibodies: past, present and future. Nat Rev Immunol. 2010;10(5):297. 3. Chan AC, Carter PJ. Therapeutic antibodies for autoimmunity and inflammation. Nat Rev Immunol. 2010;10(5):301-16. 4. Wallia A, Molitch ME. Insulin therapy for type 2 diabetes mellitus. JAMA. 2014;311(22):2315-25. 5. Morgan S, Smolina K, Mooney D, Raymond C, Bowen M, Gorczynski C, et al. The Canadian Rx Atlas. 3rd ed. Vancouver: UBC Centre for Health Services and Policy Research; 2013. 8. Blackstone EA, Joseph PF. The economics of biosimilars. Am Health Drug Benefits. 2013;6(8):469-78. 24. Sandoz Canada Inc. Product monograph: Omnitrope, somatropin [rDNA origin] for injection. 2013. 25. Klein AV. The first subsequent entry biologic authorized for market in Canada: the story of Omnitrope, a recombinant human growth hormone. Biologicals. 2011;39(5):278-81. 33. Feagan BG, Choquette D, Ghosh S, Gladman DD, Ho V, Meibohm B, et al. The challenge of indication extrapolation for infliximab biosimilars. Biologicals. 2014;42(4):177-83. 34. Lee H. Is extrapolation of the safety and efficacy data in one indication to another appropriate for biosimilars? AAPS J. 2014;16(1):22-6. 43. Régie de l’assurance maladie du Québec. List of Medications. 2015. 49. Preferred pricing for Remicade® coming in 2015. Manulife Financial. 50. Grabowski D, Henderson B, Lam D, Keystone EC, Thorne C, Jamal S, et al. 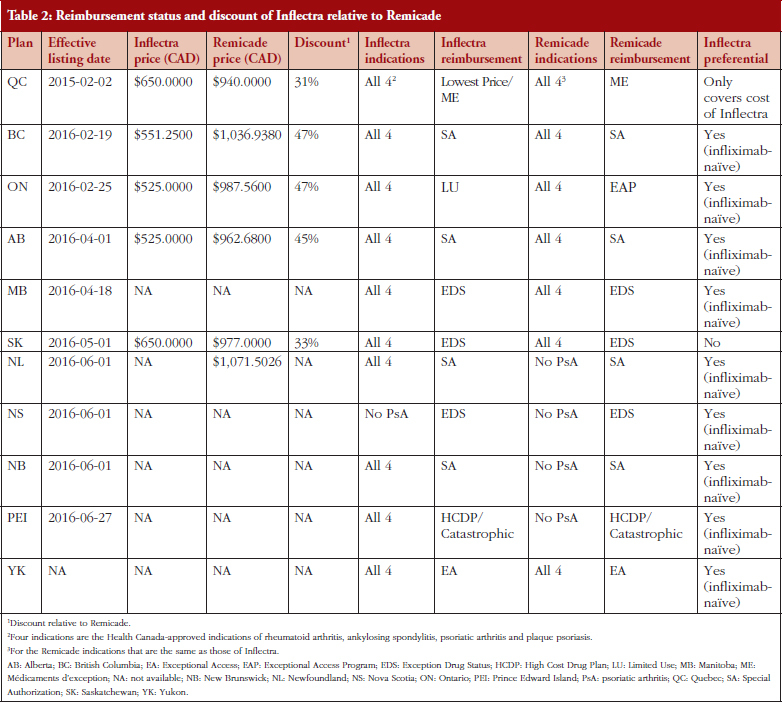 Attitudes towards subsequent entry biologics/biosimilars: a survey of Canadian rheumatologists. Clin Rheumatol. 2015;34(8):1427-33. 51. Ontario Rheumatology Association. Ontario Rheumatology Association: position paper on subsequent entry biologics. 2012 [homepage on the Internet]. [cited 2016 Sep 1]. Available from: http://ontariorheum.ca/publications/other-publications. 54. Devlin SM, Bressler B, Bernstein CN, Fedorak RN, Bitton A, Singh H, et al. Overview of subsequent entry biologics for the management of inflammatory bowel disease and Canadian Association of Gastroenterology position statement on subsequent entry biologics. Can J Gastroenterol. 2013;27(10):567-71. 57. Leveling the field in Canada 2nd edition: moving toward reimbursement equality in biologic therapy for Canadians with rheumatoid arthritis. Vancouver: BC; Arthritis Consumer Experts; 2012. 58. Russell AS, Ahluwalla V, Barnabe C, Jamal S, Offer RC, Olszynski WP, et al. Subsequent entry biologics/biosimilars: a viewpoint from Canada. Clin Rheumatol. 2012;31(9):1289-92. 61. BIOTECanada. Speaking with one voice: important considerations for SEB policy development. 2014 Jul 29. 62. Sensabaugh SM. Biological generics: a business case. J Generic Med. 2007;4(3):186-99. 63. Morelli G. Biosimilars: evolution and trends. Spanish Generic Medicines Association (AESEG); 2013; Madrid, Spain. 64. Walsh K. Biosimilars’ utilization and the role payers do play in driving uptake in Europe: an industry perspective. 11th EGA International Symposium on Biosimilar Medicines; 25-26 April 2013; London, UK. 66. Barry F. Regulators: skip clinical data and extrapolate biosimilar indications. BioPharma. 2015 Apr 29.